This year, when my daughter entered her second year in kindergarten, my husband and I knew that it was also time to put her in an activity of her choice. When she started doing her clumsy versions of pirouettes and flailing arms in the air, ballet was the obvious choice! I excitedly dressed her up in pink leotards, tutu and ballet shoes and watched her queue along with other little girls in tutus go inside their dance class. It's something that I never did when I was her age that my Mom had been hoping that I would do. Unfortunately, grace was just not flowing freely in my veins. I did go for piano lessons that evolved to tennis then drums after. Extra curricular activities do take a bit of sacrifice from us parents, as we zoom around town driving the kids to their daily activities and wait for them finish their classes. It leaves us with only one day of rest for the whole week. If it's for their physical and mental health and to keep them busy with something they are interested in, my husband and I are behind it. I think one of my fears is that they grow up not being interested in anything except watching TV or playing video games. 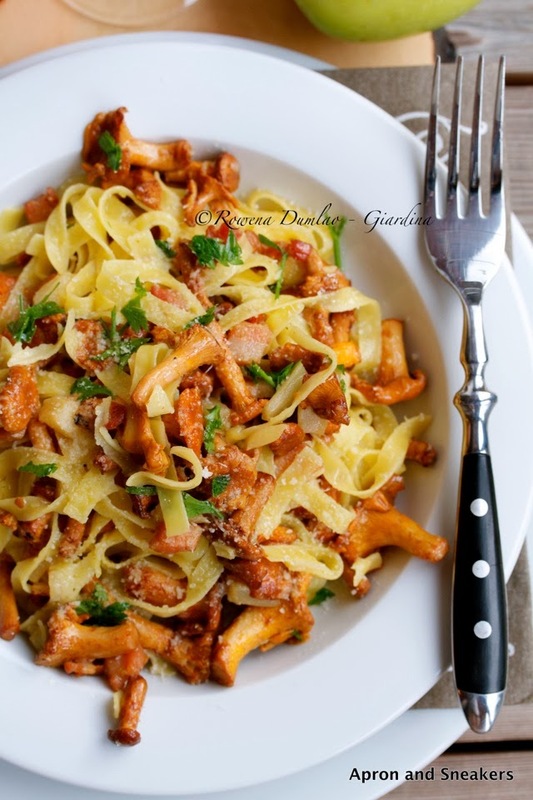 When I made this pasta, we were on holiday in the Dolomite mountains in northern Italy. It's an annual vacation that all four of us look forward to because we love the mountains. Everything rolled in with it, we love it! The food, the hiking, the air, the freshness, the activities, the people, the houses, the nature. Sigh. You know what? I wish it was already time to go back there again. One great thing about it is that it helps the kids grow better with their direct contact with nature. They are always busy with something, whether it's collecting stones, harvesting wild strawberries, running after the poor butterflies, hiking with us or getting their feet wet in the rivers or lakes. And the greatest thing of all? We do things together and we enjoy things together. Whether it's a plate of pasta or a simple walk in the woods, every single thing matters. Let me show you this pasta that we all enjoyed with mountain ingredients (but easy to find in lower land too). 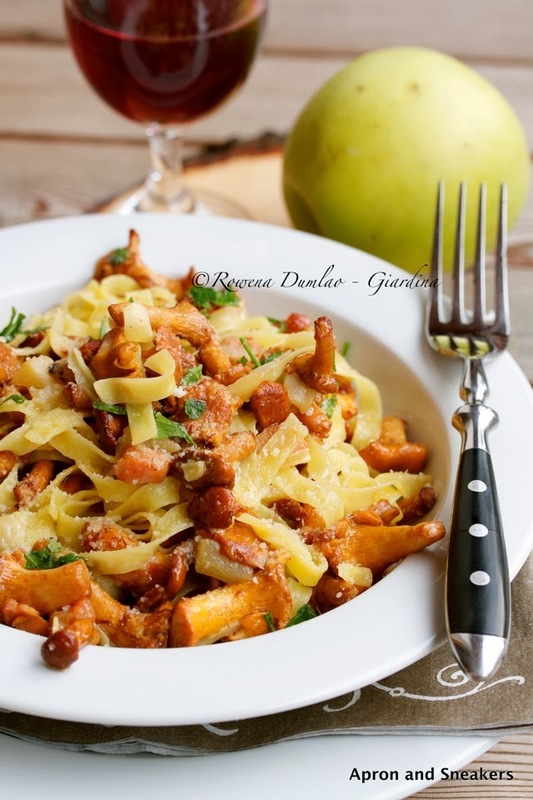 Chanterelle mushrooms, speck and apples are typical products of the Dolomites that I can also easily find here in Rome and perhaps in your own areas too. 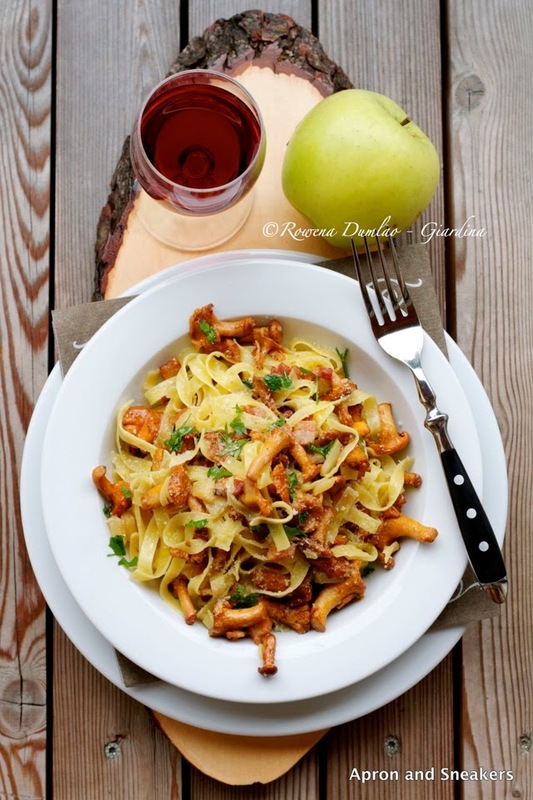 The apples give a certain surprising sweetness to the savory dish. You might love it too! Enjoy the rest of your week! Buon appetito! In a big pot over medium - high heat, boil some water. When it boils, add some salt then the pasta. Cook according to the number of minutes suggested in the package. Over medium heat, in a large saucepan with extra virgin olive oil, sautè the garlic. After a couple of minutes, add the speck. Toast for about 8 minutes then discard the garlic. Add the butter. 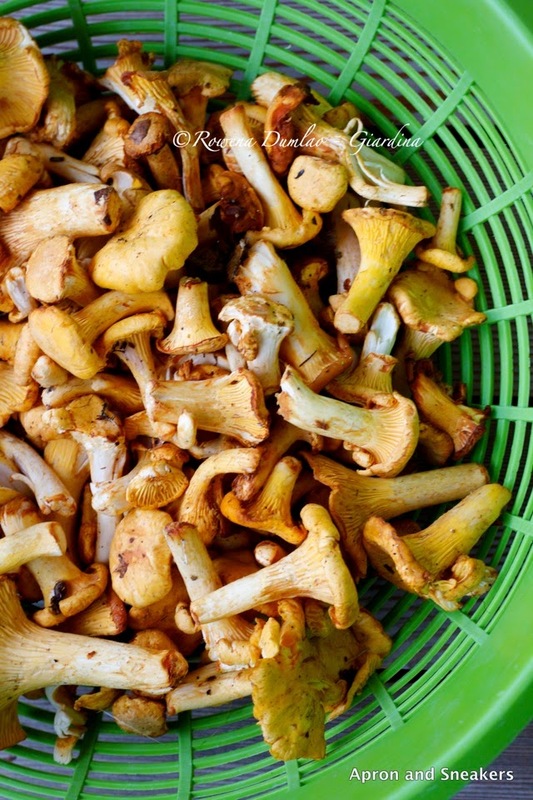 When it melts, add the chanterelles. Cook for about 5 minutes. Add the apples. Cook for 3 minutes. Pour the red wine then put up the fire until the alcohol evaporates completely, about 3 minutes. Mix in the cooked pasta.